When preschoolers don’t get their way, they sometimes attempt to intimidate us into giving in. They throw terrifying temper tantrums, some more frequently and frighteningly than others. 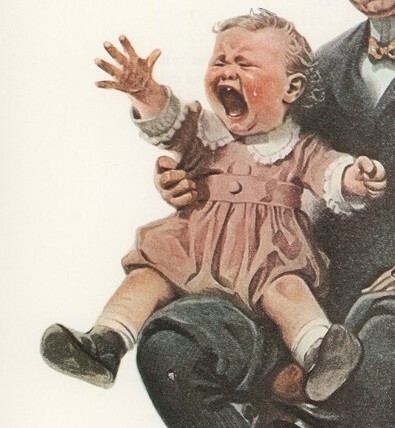 The rule of thumb is that the more spoiled a kid is, the worse the whining, crying, screaming, kicking, hitting, rolling on the floor and breath-holding. In most individuals such shock and awe antics abate over the years. But not always. When immaturity – irrespective of chronological age – coincides with privilege and a sense of entitlement, it’s liable to produce adult petulance and a proclivity for spiteful rants. This should sound abundantly familiar to anyone who heard of the “nasty” anti-Israel “tirade” by Martin Indyk, US Secretary of State Kerry’s chief envoy to the misnamed Israeli-Palestinian peace negotiations. According to the Washington Free Beacon, Indyk lost his cool for a full half-hour at the bar of a Ritz Carlton Hotel shortly after delivering an address to the Washington Institute for Near East Policy. Although predictably denied by the State Department, Indyk’s reported tantrum was quite in sync with his boss’s reactions. Kerry’s self-centered, grandiose plans to super-swiftly impose peace on Israel and its genocidal enemies didn’t quite garner him the glory he envisaged. Not only did he fail to engineer in nine mere months – as per his cocky timetable – the miracle solution to a century-old conflict, but the sides couldn’t even agree on talks about the talks. The bigger Kerry’s initial pretension, the greater was his resultant humiliation. And Kerry unleashed all his frustration on Israel – like the child who acts out before those most likely to cave in. He threatened us with BDS ostracism, new spates of terror and apartheid-state stigma. No matter how he later attempted to explain away his cantankerous conniptions, he had done us damage; he knows he had and he meant to. Some slung mud always sticks. Kerry’s crabbiness was equally expressed in his jarring failure to rebuke Ramallah figurehead Mahmoud Abbas for scuttling the process by seeking state-status in UN forms, by gumming up the works with nonstarter extortionist demands (not for ending the dispute but for restarting the moribund talks) and, most of all, by aligning himself with the jihadist Hamas – a move the US officially no longer opposes, i.e. it no longer opposes doing business with Hamas. The subtext is clear – Abbas can do no wrong and Israeli Prime Minister Binyamin Netanyahu willfully refuses to do right (by Obama Administration definitions). And just in case we failed to understand the undertones, an unnamed “highly-placed source” in Kerry’s entourage (perhaps none other than Indyk) blasted Netanyahu, empathized with Abbas and warned that, whether Israel likes it or not, Palestine shall arise – as if this is humanity’s great last hope. We can safely bet our bottom shekel that neither Kerry nor Indyk would be much perturbed by what the Palestine they so passionately prescribe would be like. If they at all gave a hoot, they might have already noticed a few troubling spoiler alerts. Ramallah recently announced that if Israel really wants recognition of Jewish-state legitimacy, then it should withdraw not just to the June 4, 1967 lines (which are in fact the 1949 armistice lines) but to the lines drawn by the UN’s Partition Resolution (General Assembly resolution 181, adopted on November 29, 1947). That resolution specifically speaks of a Jewish state. Ah, but there’s the rub. The entire Arab world violently violated Resolution 181. No sooner was it passed, then local Arabs (who then still viscerally resented the “Palestinian” moniker) launched a homicidal spree, a blood-soaked preview of what was to come. Later, when Israeli independence was proclaimed on May 14, 1948, seven Arab armies pounced on the newborn state in a concerted attack from all directions. The watching world coolly waited for the Jews to be defeated. The enlightened democracies didn’t raise a squawk about the in-your-face Arab defiance of Resolution 181. The Brits even actively aided the Arab Legion. This was despite the fact that the Jews were allotted only paltry territorial scraps, shameful remains of what was enshrined in the post-WWI San Remo Conference of 1920. Britain first ripped off nearly 80% of the total Palestine Mandate territory to form the fictional Transjordan (today’s Jordan) on the lion’s share of Palestine. Then in 1947 the UN awarded nearly half of the remainder to the second Palestinian Arab state. All the Jews got were three non-contiguous mini-patches, 11% of the total, existentially vulnerable and essentially untenable. Jerusalem was to form a “corpus separatum” – an international zone. This was in utter disregard of the fact that ever since the first census was taken in early 19th century Jerusalem, Jews constituted its overwhelming majority. With Perfidious Albion’s avid assistance, Jerusalem was quickly conquered by Jordan’s Arab legion – in impudent contravention of resolution 181. The city was liberated by Israel 19 years later, in a classic war of self-defense, but the illegal Jordanian occupation was consecrated as the status quo ante that must be restored. Nowadays, the world pretends that an actual independent Arab Palestinian state was aggressively crushed by Israel. No one remembers the Palestinian state that already exists east of the River Jordan and which cynically bears its name. No one remembers that it was none but the Arabs who scornfully rebuffed Resolution 181. Yet again, Arab chutzpah isn’t decried by Washington’s powers-that-be. The Arabs are allowed, without as much as a minor slap on the wrist, to repeatedly clamor for a return to the Square One they had just rejected. They chronically hanker after what they lost because of their own belligerence and the so-called family of nations lets them get away with the travesty. It’s only expected that heart-rending Arab nostalgia for the 1967 lines would inexorably be replaced by intense Arab yearning for the 1947 lines. And what’s to come next? What are the follow-up machinations? Sneak peeks are already amply available. They are featured often and bluntly in the reunited Ramallah and Gaza fiefdom, where the endgame is a region without Israel altogether. The latest pronouncements to that effect came recently from the al-Aksa Mosque imam, Raed al-Daana, hardly an insignificant minor official. In other words, the PA’s faithful await a replay of the orchestrated multi-state Arab invasion of 1948. Moreover, this threat to overrun Israel proper wasn’t uttered in hushed whispers but boastfully broadcast on Al Jazeera TV, wherefrom it was picked up by MEMRI, the Middle East Media Research Institute. Was Kerry in the slightest discomfited? Did Indyk wince? Heck no! It’s as if al-Daana never hectored. Hardworking western news purveyors were certainly not interested enough to quote what didn’t quite mesh with their pro-Arab and Israel-bashing bon ton. No way would they allow the truth to spoil a good storyline. Will that be the same Palestine whose “rising” is inevitable according to Kerry and/or Kerry’s mouthpiece and/or his special envoy? Sadly, that‘s precisely what Abbas, the supposed moderate in the Palestinian equation, teaches his people to expect. In English he may pose as the weary 79-year-old who has had his fill of the intransigence of irredeemably evil Jews, but in Arabic Abbas sounds chillingly different. He is the one who welcomes convicted mass-murderers sprung from Israeli prisons. He exalts them as national heroes and role models for Arab youths. He is the one who names schools, streets, city squares and a host of institutions after suicide-bombers and other assorted slaughterers of Israelis. He is the one who glorifies still-incarcerated butchers. He is the one who earmarks hefty financial disbursements to both terrorists and their families (bankrolled by inimical European philanthropists). Abbas is the one whose school system conditions the minds of youngsters from kindergarten age onwards to hate Jews, aspire to annihilate them and destroy their state. He is the one who endorses the same messages in both the electronic and print media that he controls outright. He is the one who allows preachers in the mosques under his direct aegis to brainwash believers into denigrating Jews as loathsome offspring of “pigs and monkeys,” whose extermination becomes a sacrosanct commandment. No one exposed to Abbas’s education, press or religious indoctrination can conceivably be ready for the hallowed two-state harmony that Abbas seems to grudgingly strive for in English. The truth is that neither Abbas, his newfound bedfellows in Gaza nor the masses in both Palestinian Authority halves, remotely desire co-existence side-by-side with a Jewish state. Their aim is the piecemeal Arabization of the de facto entity temporarily called Israel (which is why they won’t concede Jewish-state legitimacy) or its vanquishment as al-Daana anticipates. In either case the idea is for an Arab Palestine to devastate and supplant the Jewish state. If Kerry doesn’t realize this, then he’s even more incompetent than is generally presumed. If he realizes this but doesn’t care, then we can only conclude that his temper tantrums had effectively cancelled out any residual reason and self-control. Kerry must be told in no uncertain terms that Israel will not be browbeaten by childish churlishness, juvenile threats or choleric fits. Israel will not commit national suicide for the sake of Kerry’s aggrandizement. Temper tantrum tactics just won’t work. Thank you Sarah for this latest blog, which should remind your avid readers, and hopefully some of those Jew Haters mentioned in your article, that ‘ 65 PLUS YEARS OF PHONY CHARADES’ TOWARD THE PROPOSED 2- STATE SOLUTION’ FOR ISRAELS’ socalled peace and survival plan’ is, and always has been, total nonsence for the good and welfare of Israel and its citizens future! Unfortunately, PM Netanyahu in his ‘early years’ of leadership has ‘promoted the 2-state solution’, which in my opinion, has kept this ‘solution nonsense’ as a bleeding sore, alive, and ‘fodder for Israels dissection by its enemies! He, now, is under great pressure to finally give up ‘his wimpyness and appeasment to Israels adversaries’, and is coming forth with more public statements about ‘WHAT IS GOOD FOR THE STATE OF ISRAEL, AND WHAT ISRAEL CANNOT ACCEPT BY ANY OUTSIDERS WHO HAVE NO INTERST IN ISRAELS, AND ITS CITIZENS SURVIVAL! Sarah you said it all ! YOU are simply the best. Crybaby Kerry lost his gambit, the time is high for him to resign, he will NOT BE MISSED ! Great analogy. A related one is how a spoiled kid A drops what he or she has in order to grab what B has, even though the thing in question never interested A until he or she saw that B had it! – My “favorite” example these days: Building a Muslim mosque and a Muslim Shrine on top of the Temple Mount in Jerusalem – thus creating Islam’s third holiest place with no basis in the Q’uran. PS – I’m actually surprised that the Arabs have waited this long to openly say that they want to go back to res 181. Why can’t YOU be Israel’s president? The office needs someone with clarity.